Murosky cousins Irene Chanis and Harry Anthony Murosky photographed in 1937. Irene Chanis, the daughter of John Chanis and Margaret Murosky, would have been 17 years old when this photograph was taken. 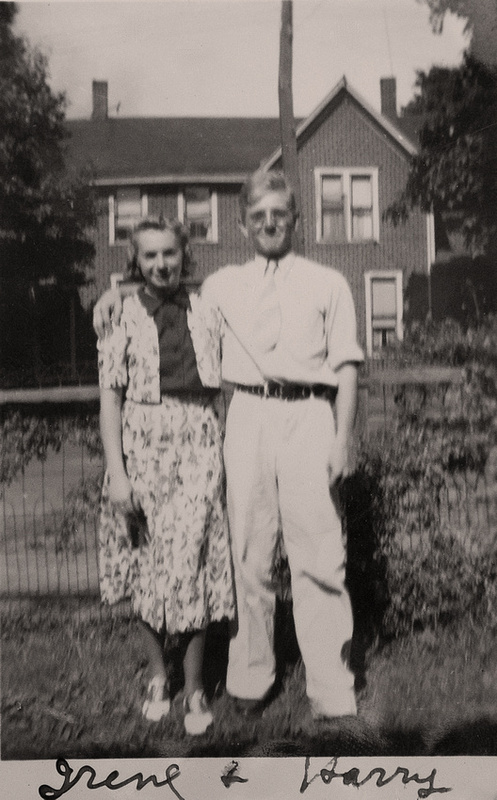 Harry Anthony Murosky, the son of Anthony Harry Murosky, Jr. and Helen Tillie Bukowski, would have been 16 years old when this photograph was taken. The location of the photograph is unknown. The photograph was most likely taken in Erie, Erie County, Pennsylvania. This photograph was likely taken at a Murosky family gathering. Harry is wearing the same clothing in this photograph and in a photograph from the gathering. To view photographs from the Murosky family gathering Family Photos: 1937 Murosky Family Gathering. The photograph was part of the Helen Tillie Bukowski Collection. Helen most likely recorded the names on the photograph. Helen was married to Anthony Harry Murosky, Jr. Anthony was the brother of Margaret Murosky, Irene's mother. Photographer Unknown. Editing and digital restoration by Michelle M. Murosky. Margaret Murosky is my 2nd great aunt. She is the sister of Anthony Harry Murosky, Jr. my great grandfather. Anthony Harry Murosky, Jr. married Helen Tillie Bukowski. Their son Harry Anthony Murosky is my great uncle. Margaret's daughter Irene Chanis is my 1st cousins 2x removed. Ancestry.com. 1920 United States Federal Census [database on-line]. Provo, UT, USA: Ancestry.com Operations Inc, 2010. Images reproduced by FamilySearch. Year: 1920; Census Place: Forest City Ward 1, Susquehanna, Pennsylvania; Roll: T625_1655; Page: 3A; Enumeration District: 68; Image: 226. Record for John Chanis. Ancestry.com. 1930 United States Federal Census [database on-line]. Provo, UT, USA: Ancestry.com Operations Inc, 2002. Year: 1930; Census Place: Edwardsville, Luzerne, Pennsylvania; Roll: 2066; Page: 19A; Enumeration District: 0031; Image: 883.0; FHL microfilm: 2341800. Record for John Chanis. Ancestry.com. Pennsylvania, Death Certificates, 1906-1963 [database on-line]. Provo, UT, USA: Ancestry.com Operations, Inc., 2014. Record for Margaret Chanes.